I love to make pizza just about any way I can....I have made it in a springform pan, on naan bread, and on bagels. But a few weeks back, I saw a picture of a pizza in a cast iron skillet. What. The. Heck?! Why didn't I think of it before?! 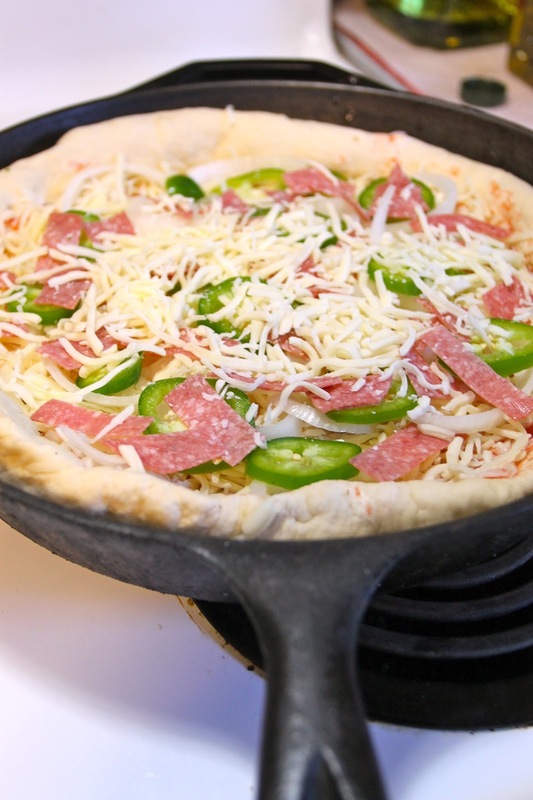 It's totally brilliant AND, I figured, a great way to make a deeply deep dish pizza. Making pizza this way is my new favorite, however, I do feel that I have to admit that I made this particular pizza a little too deep dish...I know, it's hard to believe, but I should have used less dough. Not that it stopped me from eating it. Not that it stopped me from enjoying it. Not that I look back on this pizza with regret. I don't. I dough-n-t. Hehe. One of the great things about making pizza this way is that you don't need to grease the pan, and you don't have to put cornmeal down on your pan. The pizza doesn't stick and the pan heats so darn evenly you will think that fairies made your pizza with their little magic fingers. Other than that? There is no difference. I preheat my oven to the same temp (450) and let it get good and hot for about a half hour. Then I prepare my dough. I would also like to take this time to initiate some bragging rights. I stretched this dough by hand this time. This is quite an accomplishment, I have to admit, because usually I use a roller. And it's totally acceptable to use a roller, but we can all agree it's extra crafty if you can stretch it with your hands....only took me about 20,467 pizzas and 3 years to learn. No biggie. Sauce, cheese, toppings, and then just a splash more cheese for good measure. For some odd reason, I am obsessed with eating things extra spicy these days so I did some jalapeños, onions, and salami. Yes sir, it was a mighty-fine pizza time! I baked this sucker for 15 + minutes until it was alllllll goldeny on top. Okay, so, I am obviously stoked on making this pizza, but I also want to hear from YOU! Tell me, what are some of your favorite pizza tricks/tips/cheats?! Share it with me the comments section below!